The Australian Terrier is one of the smallest sized dog in the terrier category, and also one of the smallest working terriers in the world. This breed was bred in Australia for many uses, it works as a good watchdog, shepherd, a companion dog and a vermin hunter. Australian terriers were initially bred in Australia but their ancestors are believed to be from Great Brighton. 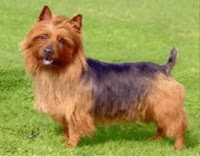 The Australian Terrier is known and unique to be the first Australian bred dog to participate in shows and is the first Australian breed to be recognized and registered internationally. The average mortality age for the Australian terrier is about 12.1 years. Major causes of death among this breed is cancer, old age and diabetes. Major health problems and diseases this breed faces are Endocrine (Primary Diabetes), Allergic dermatitis, and musculoskeletal. Some other not so common health problems include, adult cataract, and ear infections in about 4% of the breed.